Manage all your iPhone files, music, video, contacts and other files with Xilisoft DVD to iPhone Suite. 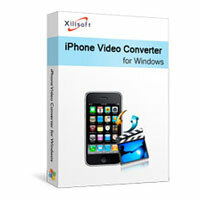 Included in the Suite are Xilisoft DVD to iPhone Covnerter and Xilisoft iPhone Video Converter. Xilisoft DVD to iPhone Converter – Converts Home DVD so you can play them on your iPhone (MP4/MPEG-4 videos and MP3, M4A and WAV audio format respectively). Xilisoft iPhone Video Converter – converts any video format (AVI, MPEG, WMV, H.264/AVC, DivX, MOV, MKV, 3GP, RM and VOB) to iPhone-format video (MP4/MPEG-4 and MOV) and audio (MP3, WAV,M4A, AAC and AIFF). This software can also transform CDs to iPhone supported audio files. Xilisoft iPhone Video Converter is the best iPhone converter software to convert all video files such as MOV, MP4, RM, RMVB, DivX, ASF, VOB, 3GP, WMV, MPEG, AVI to iPhone MP4 videos and MP3, M4A audios, and convert other audio formats to iPhone music files. Xilisoft DVD to iPhone Converter serves as a DVD to iPhone video and audio converter to convert home DVD to iPhone video MPEG-4, and iPhone music MP3, WAV, M4A, which makes it easier to put DVD movies on iPhone with great quality and super fast speed.